It is an unfortunate reality that for most amputees, a single prosthesis cannot fulfill all the mobility requirements for each individual. For example, a daily use prosthesis (commonly referred to as a primary prosthesis) cannot be used as a shower prosthesis as water would cause corrosion of the prosthesis components, or be used to play squash, as the foot may not have adequate shock and rotation absorption which would make it uncomfortable to use while playing squash. 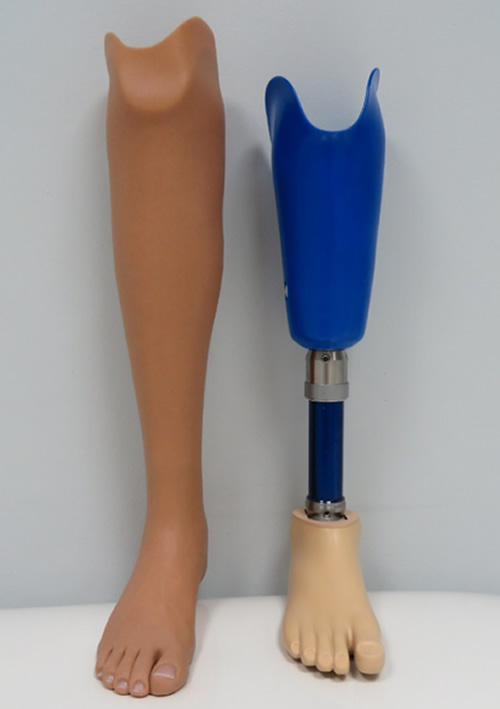 The prosthetic socket and suspension mechanism (for example, a silicone locking liner) for a daily use prosthesis and a sport prosthesis may be very much the same, the difference would be predominantly in the functional components of the prosthesis, such as the prosthetic foot and the prosthetic knee – if relevant with an above knee amputee. 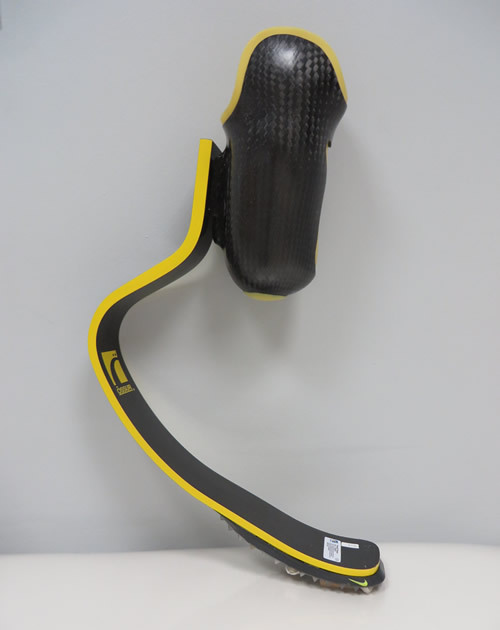 The prosthetic socket of a sport prosthesis may however contain additional pressure pads or a soft inner lining to provide additional protection of any bony prominences. When participating in sport, there is often much higher ground reaction forces which are translated to the residual limb in the socket, any additional cushioning therefore provides more comfort and protection of the residual limb. There are many different types of recreational activities or sport that would require a special prosthesis designed specifically for the relevant activity. Common sporting activities most amputees participate in would be jogging, sprinting, cycling, tennis, table tennis, squash, volleyball, playing bowls (many older amputees) and water sports such as surfing, water skiing and diving. 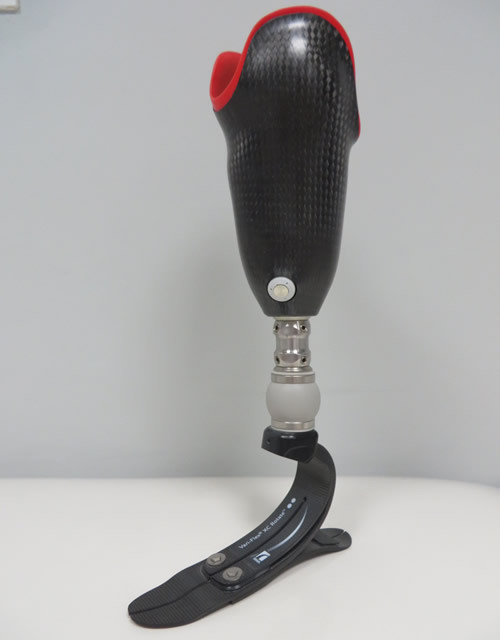 For activities such as jogging or sprinting, a prosthetic foot would be required that have a high amount of shock absorption capability, while also returning as much energy as possible. with an additional cushioning lining inside the socket (the orange lining visible inside). 2. 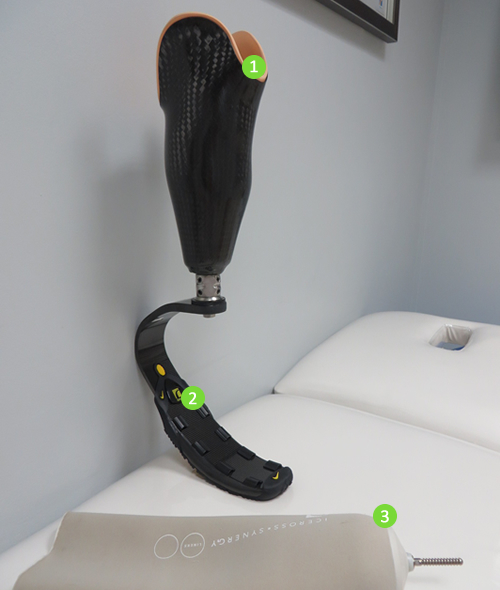 The Flex-run Prosthetic Foot with Nike-sole. 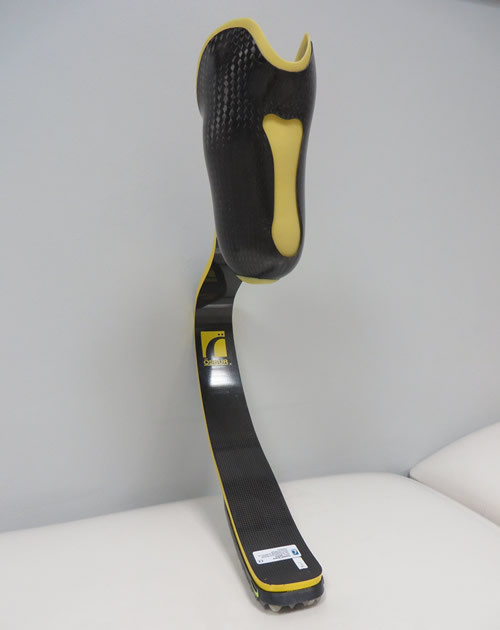 The large "c" shape curve allows the foot to compress and provide a high degree of shock absorption and "recoil" – which returns as much as possible of the aborbed energy. 3. The Silicone Locking Liner used for the suspension (attachment) of the prosthesis. 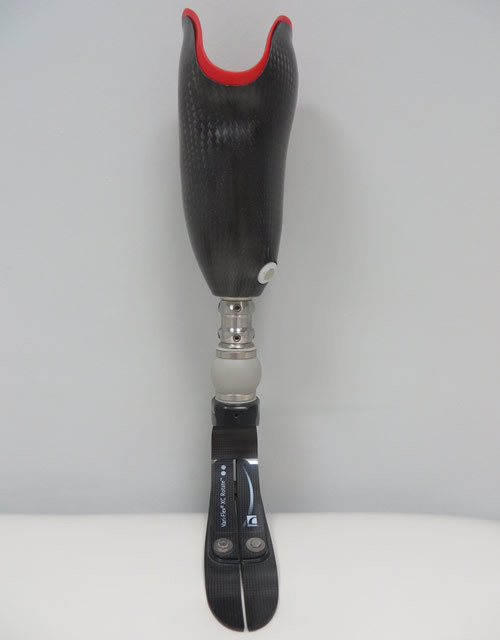 Together with the internal lining of the socket, it provides protecton of the residual limb. 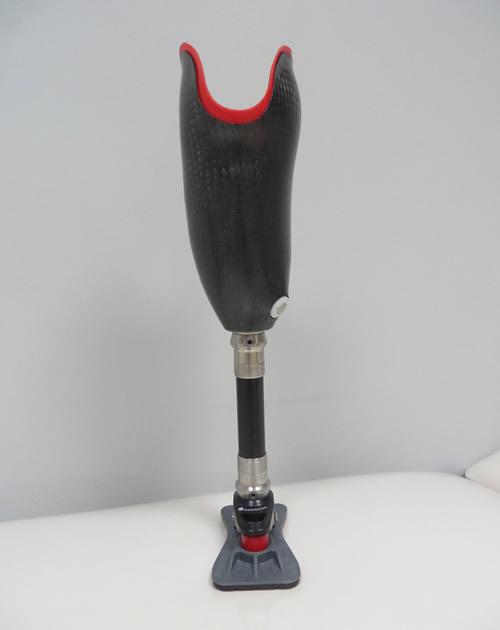 A sprinting prosthesis with an ossur cheetah blade foot. this foot has a high potential for shock abosrption and energy return. For activities where both a form of running and turning is required, such as squash, tennis and volleyball, a foot with a moderate amount of shock absorption, with combined rotation absorption would be required. The rotation component, is often an additional integrated component. The shock and rotation absorption is very important as it absorbs what is called "ground reaction forces" and reduces the transfer of these forces to the soft tissue and skin of the residual limb within the prosthetic socket, thereby improving comfort and protecting the soft tissue from injury. 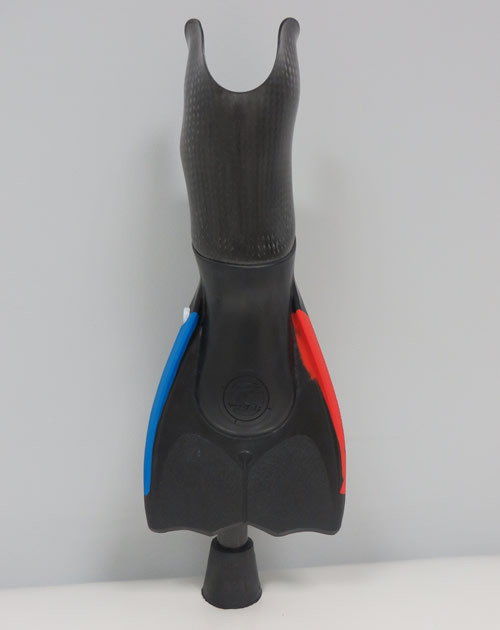 A prosthetis that would be suitable for recreational or sport activities where both shock absorption and rotation absorption would be of benefit, such as squash or tennis. the grey ball on top of the foot asorbs both shock and rotational forces. 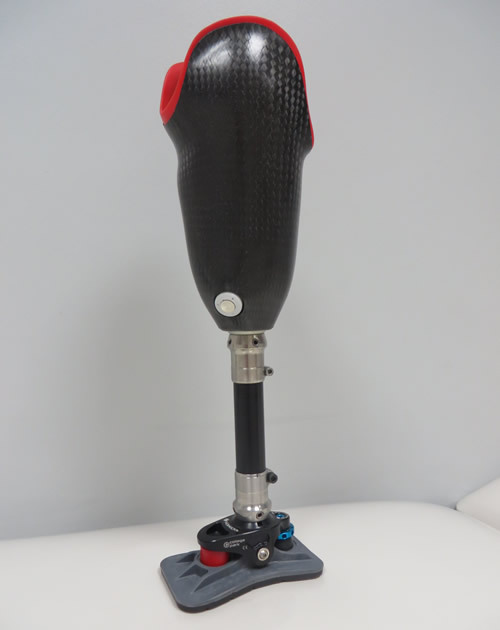 For cycling, often a very basic prosthetic foot can be used, as the foot does not need to absorb shock or rotation, however, the alignment of the prosthesis needs to be adjusted as well as the posterior trim line (the top, back edge) of the socket needs to be lowered to allow for the large knee flexion angle that occurs in cycling when the pedal reaches the top of the circulation. Most prosthetic components are not designed to be regularly exposed to water, especially not salt water. If a standard daily use prosthesis does get wet, it could be opened, cleaned and dried without any long term damaged being caused. However, this is not practical if the prosthesis is exposed to water on a regular basis, such as for showering. It is therefore most practical for an amputee to have an additional shower or water activity prosthesis, where components and materials are used that is designed specifically to cope with exposure to water and very often also to sand, if used on the beach for example. 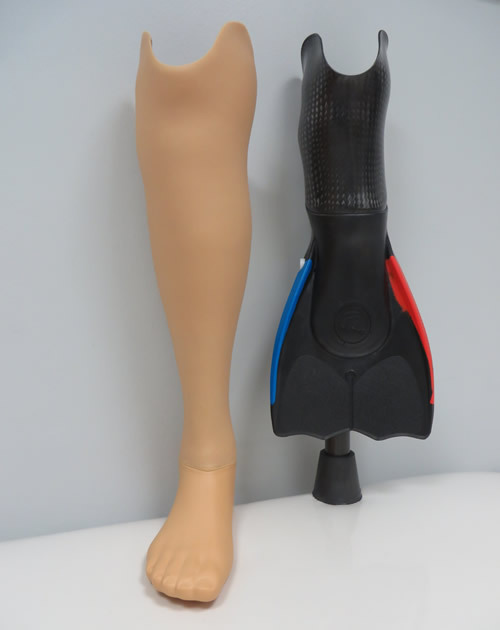 A patients daily use prosthesis with low definition silicone cosmetic cover, and a beach and diving prosthesis where a flipper is incorporated to the prosthesis. a simple rubber plug "foot" is used as there are no moving parts that can deteriorate when exposed to water and corrosion of sand. Almost all amputees can benefit from a shower prosthesis. It is unsafe for amputees to hop on their sound side limb (when not using their prosthesis) in and out of a shower or in any bathroom where the floor is potentially wet. It is not uncommon for amputees to fall in bathrooms where water and loose bathroom mats are a hazard for slipping when hopping on one leg or when using crutches. Getting in and out of a bath with the support of only one lower limb is strenuous and requires good upper body strength; it is difficult for even a young person to perform. Over the lifespan of the amputee, increased strain on the sound side limb due to activities such as hopping on the limb or taking all of the body weight when not using a prosthesis, can result in earlier degradation of the sound side limb, particularly the knee and hip joint. This same shower prosthesis can also be used for any recreational or social activities where there is potential for the primary or secondary prostheses to get wet and corrosion to set in, for examples: Going to the beach where the foot is exposed to sand, into the ocean or into a pool exposing it to water, being outdoors when it rains, washing a car with a garden hose. "Hybrid Prosthesis" - Myo-electronic hand and elbow / mechanical shoulder joint. Boston Elbow with Bebionic 3 Small hand. A patients daily use prosthesis with high definition silicone cosmetic cover, and a shower and water activity prosthesis. a simple andrelatively low cost prosthetic foot (the aqua foot) is used as there are no moving parts that can deteriorate when exposed to water and corrosion due to exposure to sand. This particular patient lives next to the hartebeespoort dam and uses the prosthesis for showering, when going into a swimming pool and to ride on a jet-ski. A water activity prosthesis, ideal for use on the beach, or to be used as a shower prosthesis. the prosthetic foot device, the "side kicks" foot, has a large surface area sole that is non slip. 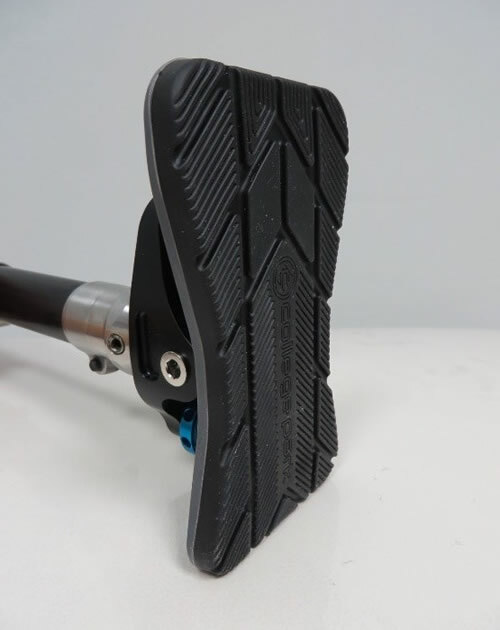 a single axis ankle design with rubber bumpers allows for roll-over, over the foot during walking.